China Mieville's New Crobuzon novels portray a corrupt city where the forces in power are utterly morally bankrupt. In stark contrast to the cliche-ridden rut of modern fantasy literature, no shining knights or noble lords infest the universe of Mieville's fecund imagination. His characters are drawn from the radical bohemian crowd that thrives in the interstices of this city - anarchist journalists, labour organisers, avante-garde artists, and disgraced scientists. It's no surprise when you consider the author's political leanings - he's a dyed-in-the-wool Marxist with a PhD in International Law who actually ran for Parliament as a Socialist in 2001. In this context, power structures are examined from the perspective of the downtrodden and the oppressed - and found deeply wanting. Rather than holding the status quo as some natural state of goodness, a crippling stasis is held in place by the forceful action of the corrupt and powerful. Narratives that build from this perspective tend to resonate with our inner sympathetic selves. It's no coincidence that most great adventure stories are told from the perspective of the underdog - the Rebel Alliance against the Empire, Indiana Jones against the entire Nazi Reich, and so on. On the other hand, it also provides a solution to the problem presented by Zak S in his article Sandboxes and the Roguish Work Ethic. 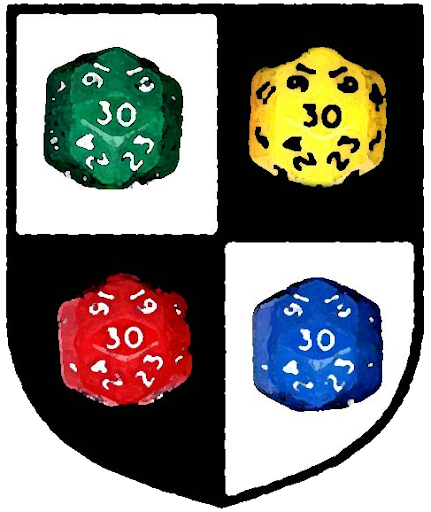 Upstanding moral heroes who act to preserve the status quo make no sense in the sandbox-style gaming so beloved by the OSR, which is why dungeons tend to be filled by roguish heroes and wandering murder-hobos. Preserving the status quo is an inherently reactionary position to take up, and that's why Superman makes no sense as a hero in a sandbox - he needs an active threat, a pre-meditated plot to respond to before his narrative actually takes place. The world is filled with horrible monsters. We can't possibly kill all the monsters. But if we kill enough, we might save some people and get stinking rich from treasure. The world is ruled by the corrupt and powerful. We can't possibly destroy all of the corrupt power structures. But if we destroy enough, we might lessen the burden of the proletariat or inspire a broader revolution. Basically, you are building a game where the terrorists are the good guys. So what do you need to build a sandbox for a motley bunch of Marxist revolutionaries? Characters should be drawn from the anarchists, the downtrodden, labour organisers, bohemians, radicals - those who have an interest in overthrowing the established power structures. In keeping with the tradition of sandbox adventurers, you don't want to create too much background for the characters, but they need to have a rationale for opposing the entrenched hierarchy. A random generator for motivations and radical affiliations is probably all you need; they can still be fighters, wizards, and rogues, but they're fighters, wizards, and rogues from outside the system's social consensus. If you have all the characters start off as members of some revolutionary cell or outlawed organisation, you've got all the motivation you need for the "adventurers" to start robbing some banks. There are a tonne of articles around the blogosphere explaining why the old-school "treasure for XP" mode of play helps deliver the ideal sandbox experience for roguish adventures. In short, the idea is that "treasure for XP" rewards inventive play in a way that "quest XP" or "monster XP" simply doesn't - you have no incentive to face that monster other than its treasure, and if you can steal or capture the treasure through other means beyond direct confrontation, you're just as well off. This is the sort of play we want to encourage in our revolutionary PCs, but "treasure for XP" might not create the right kind of incentive. Our mystical Marxists aren't adventuring to gather wealth and become part of the establishment - they're here to bring down The Man, and liberate the proletariat from oppression. We're looking for something that encourages inventive play towards the destruction of capitalist power, not accumulation of it. Option number one is simply to rephrase the idea of "treasure for XP". Instead of gaining XP per unit of wealth acquired, you could award XP per unit of capitalist wealth destroyed or redistributed to the oppressed classes. It's a reasonably simple method that might work if you want to keep the granularity of old-school experience systems. Did we learn something new and important about the City? Did we overcome a notable source of oppression? Did we lessen the burden of the proletariat? and award experience on that basis. The Marxist sandbox has to be a city - in fact, it has to be the City. 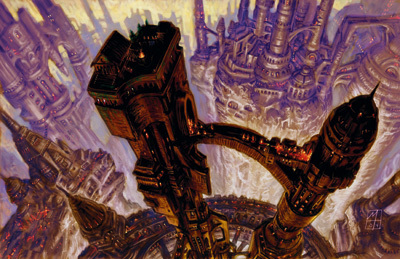 The traditional sandbox might be a border region perched on the edge of a monster-filled wilderness, but Marxist fantasy simply doesn't happen without industrial smokestacks belching forth noxious gasses in a city heaving with oppression, and the PCs can't be oppressed if they can simple escape the oppressor's power by leaving the city. 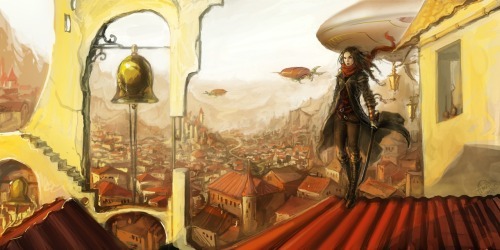 It is a place like Sigil, or Sharn, or Vornheim, or MoBu City - a city that's a world within itself. It should sprawl over many varied districts, each with their own unique character, some impoverished and ruined, others decadent and corrupt. Mapping the city probably defies logic and the ability of the game master, but Zak S and Chris Kutalik might help. You might want to write a random generator for neighbourhoods, or steal an existing city and turn it in upon itself, using the perspective of a bottom-rung anarchist. James Maliszewski talks about the importance of locales to the old-school method of play with his usual eloquence here; sandbox games don't run on pre-written plots. They need baroque locales for adventures to plunder and depths for adventurers to plumb. In a traditional sandbox, these are ancient tombs, lost temples, and haunted caverns. Our Marxist sandbox will instead be populated with mansions of venal judges and captains of industry, hellish factories, opulent banks, guard barracks, and corrupt temples. You can even have dungeons and caverns beneath the City, populated by the local powers of the underworld. Each locale should be ruled by some element of the oppressive hierarchy, the monstrous rulers of our anarchists' nightmarish world. In a twist on the traditional idea of the monster's lair, the various elements of a specific reactionary power's base may not all be located in one area. A bank may have branches across town, the town guards are certain to have many watch-houses, and an underworld figure may own several establishments across the City. You should treat these in some way as being part of the same adventure locale; if the players want to destroy the bankers' power, they may have to hit several different branches, or perhaps they just have to kidnap the owner from his harem-palace in the High Tower and hold him to ransom. Predators: those who feed on the suffering of the populace, either literally or metaphorically. Opiates and Enforcers serve their needs, if perhaps indirectly. Opiates: those who try to keep the populace ignorant of their suffering. Enforcers: those who keep the boot on the neck those who try to rise up above their assigned station. Destroyers: the dark side of your revolutionary protagonists, these are not oppressors but instead destructive forces who aim to break everything down, not just the agents of oppression. The front structure of Dungeon World might be an inspiration here when it comes to designing your sandbox, but with an important difference: the villains of the City are, with the exception of the destroyers, concerned with the maintenance of the status quo, not its downfall. In fact, this idea is what makes the City such an excellent sandbox for old-school gaming - the status quo mirrors the initial situation of a wilderness sandbox, infested with monsters and hostile to human life. Without the character's intervention, the machinery of oppression will simply continue to grind away, a boot stamping on the face of humanity forever. You might also find this Dungeon Dozen to be a useful aide. This ole Make Your Own New Crobuzon blog post might be worth taking a gander at. Oh man, that post and the subsequent thread is pretty much the dreamsauce that gave birth to this idea. As a lover of sandboxes and a despiser of Marx, I think this is awesome. Great ideas. This puts me greatly in mind of the Underground RPG, where ex-military superheroes fight a corrupt corporatocracy. I can see all kind of possibilities for this!